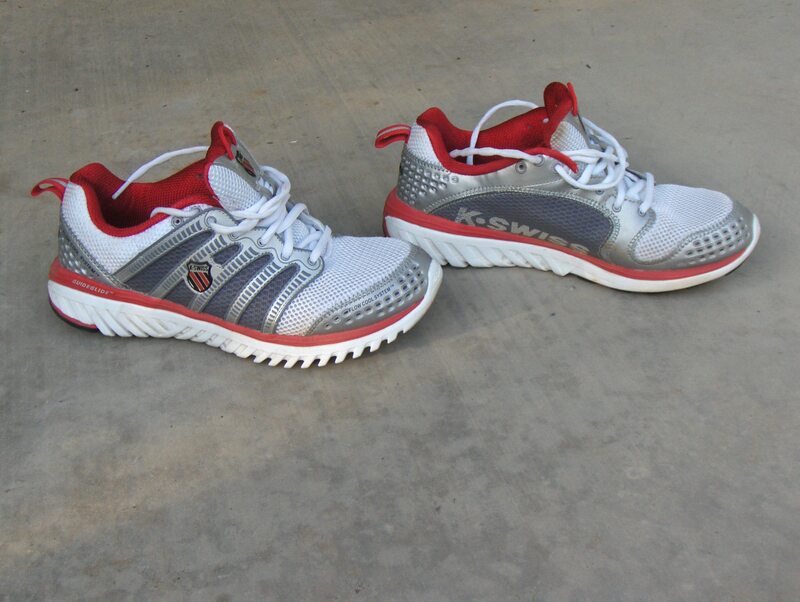 I really liked the K-Swiss Blade Light shoes from the moment I tried them on. When I say really like, I mean as in let’s date like. Running shoes are something I view as a long term commitment. When you find a pair you like, clean out the store’s inventory and run in them. But never buy multiple pairs before you try. Always give them a few whirls around the block. The K-Swiss blade lights felt fantastic when you put them on. Slipper like, very comfortable. Smooth insides, seams were where they should be and not were they shouldn’t be, same with the uppers. They ran so well out of the box, it was like a dream. Firm heel cushioning, great cushioning under the foot without being bulky or clunky. They run light, they feel quick, they feel good. I can remember thinking I’ve found a new shoe, time to go grab a few more pair. Some shoes run better after you put 20 or so miles on them, these shoes run great straight out of the box. But in many relationships, as time goes on, you start to see some cracks at the seams. At first it becomes a shoe for your shorter runs, then you notice you are avoiding that shoe when it comes up in the daily shoe rotation. Maybe you even shun it once in a bit. That’s what I found happening as I got more and more miles on it. Trisports University reviewed the shoe and gave it pretty good marks. I’d be willing to bet that the testers had under 50 miles on the shoes when they wrote the review. As I accumulated more and more miles, I noticed that the shoe broke down pretty fast. Especially compared to some of the other shoes in the rotation. Especially the foot I tend to pronate on. In fact it’s only the foot that pronates that feels like and looks like it’s broken down. Within 50 miles it was noticeable and now after having over 100 miles on the shoes, the breakdown under the ball of my pronating foot is very severe. Severe enough that these shoes are going in the junk pile. I’m sorry K-Swiss Blade Lights but it’s not going to work out. It’s you not me. There were two other minor complaints I had with this shoe. The first is the sole collects pebbles. If you want to be a pebble hound this is your shoe. The second complaint is it didn’t run well on uneven surfaces like grass and packed trails. The final complaint I have with this shoe isn’t with the shoe per se, it’s the market the shoe is designed for. My problem is with triathletes who think they need special gimmicks in their training shoes. This shoe has tiny holes to allow water to drain out. I’ve been running for a few years now, have about 10-15000 miles in my legs, a couple of those in the rain or in races where I’ve gotten water in my shoes. It’s rare when I wished my shoes would drain better. The industry joke about triathletes is stick any dog product on the market and put the word triathlon on it. It’ll become a best seller. Sad but true. Triathletes buy more gimmicks then any three runners or cyclist combined. It’s a shame about this shoe. 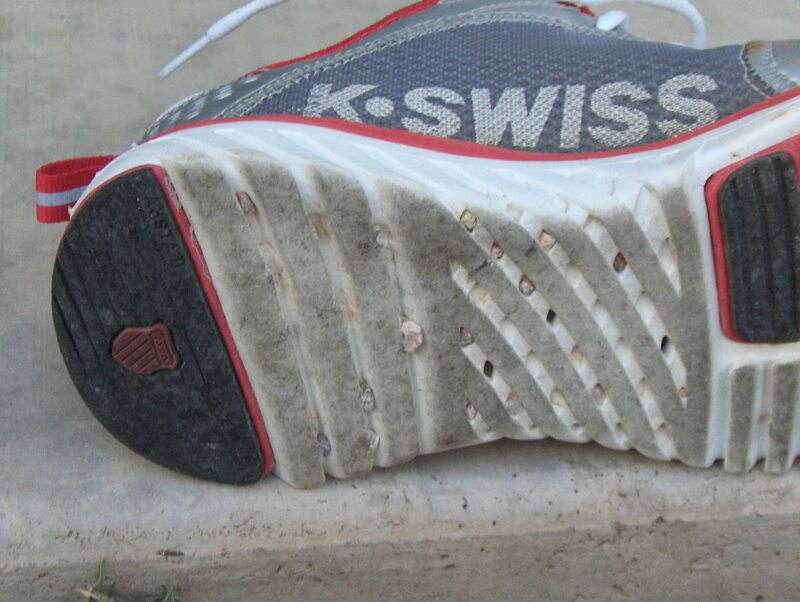 K-Swiss has dumped a ton of money into R&D and a ton more into sponsorship of some of the world’s top triathletes. Unfortunately until K-Swiss can make up some ground on this shoe compared to the front runners it’s not going to capture significant market share. I was able to listen to Mike Rouse, one of the K-Swiss product managers, speak about the process of designing and building these shoes. He talked about the development that has gone into the shoe and what they are trying to accomplish. They have a lot going right with this shoe, especially with the fit, feel and how blissful it runs right out of the box. If they could improve the durability of this shoe and change the bottoms a bit, they might find themselves latching onto the pack ahead of them. great review Brian, I wanted to like those as well but I didnt like the fit, felt like they wanted me to supinate.. Thanks! It’s the first of two shoe reviews and I wasn’t sure how it’d turn out. Hmmm… I was hoping to move to K-Swiss (Konejo) because I can get a damn good deal on them. Tried them on in Kona and they felt FANTASTIC, but your review makes me wonder about the brand and I’m not sure I know anyone running in them that isn’t sponsored. I think considering the price I can get them for, they are still worth a shot. I’ll be interesting to see if the Konejo’s stand up better. So, in short, you recommend the shoe for a one-run stand. Were you drunk when you tried it?